A food blogger I am not. No fancy camera, no food styling. I did attempt to take a foodie picture of the final product. You know I had to fizzy up the frosting and not just smooth it on with a knife. My husband ended up having 2 pieces. I'd say he'd give this box cake mix 2 thumbs up. Exactly! Why didn't I think of that. Thank you. 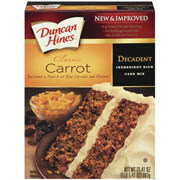 Carrot cake is one of my faves, too! My friend's mom makes the best, so I have to get the recipe from her or him.